The following originally appeared on 8/28/08 at Exit 51. After the (mis)adventures getting my pictures entered into the Maryland State Fair, my hope was that at least one of my entries would win a prize. Yes, I thought some of my pictures were awesome. But was my ‘awesome’ and the judges’ ‘awesome’ the same thing? There was only one way to find out, so we went to the Fair. 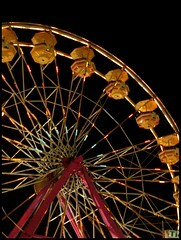 And here’s the thing about the Fair – it can be a County Fair, a State Fair, whatever – the Wheel of Fortune is everywhere. Look at the midway. Booth after booth of games of chance. Pop the balloon, win a prize! Knock down the milk bottles, win a prize! Toss a golf ball into a fishbowl, win a prize! 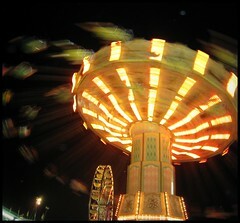 And off the Midway too. Got the best pig, win a prize! Cattle more your thing, we have prizes for those! We even saw a demonstration of a chainsaw artist. Not losing any fingers while carving a fox out of a tree trunk, that’s a prize! All I’m saying is that the Wheel of Fortune either lands on the number you bet or it doesn’t. If it does, congratulations, here’s your prize. If it doesn’t, you can keep trying. Although maybe not winning the life sized, lime green, stuffed bear really IS a prize. The Wheel of Fortune did not land on any of my numbers that night. That’s ok. I have a whole year for it to spin around. And who knows, maybe next year when I go to collect my entries after the Fair winds down, I’ll be one of the ones taking home a prize (as long as it’s not that life sized, lime green, stuffed bear)! 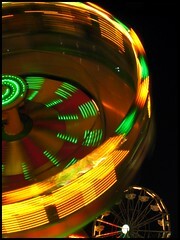 I love experimenting with exposure on carnival rides! Nice captures! Thanks Brooke. I need to get more practice with long exposures but I was really pleased with these. Think you’re right, not winning the green bear is the prize! Dude, that green bear was a booby prize. I wanted no part of it.